I would like to apologize for running through the sprinklers in your backyard while whooping and hollering late Friday night. I have no excuse for my boorish behavior other than to say, wine makes you do crazy things. I hope all is forgiven. Hence, the Gerry Rafferty. “Right Down The Line” will always be special to us. (Even if it wasn’t, City To City is the perfect 70s pop album and should be a part of everybody’s collection). Back to the wine, though. Apparently it flowed pretty freely, because next thing I knew, Tara was tugging at my hand, urging me to run through the sprinklers with her. It had been dark for hours, and the in-ground sprinkler system in the complex had just come on with a whoosh. I didn’t know if she was serious or not, but I didn’t wait to find out. We ran together, hand in hand, laughing and, at one point, shouting (oops) and I’m sure the neighbors did not appreciate that, but it was one of those moments where you feel completely alive without a care in the world, a snapshot in time to freeze for posterity. I don’t regret it for a moment, though I am truly sorry if our shenanigans woke anybody up. I blame it on the joie de vivre. We paid for all that wine later, and by we, I mean Tara. For whatever reason I rarely get hangovers. Stranger still, I find myself jealous over Tara’s, as though because my head isn’t throbbing the next day I’m missing out, when in reality the only thing I’m missing out on is hugging the toilet. Really, I should consider myself lucky. Grooviest vintage store find ever! That is why I love the 70s. A simpler time, indeed. 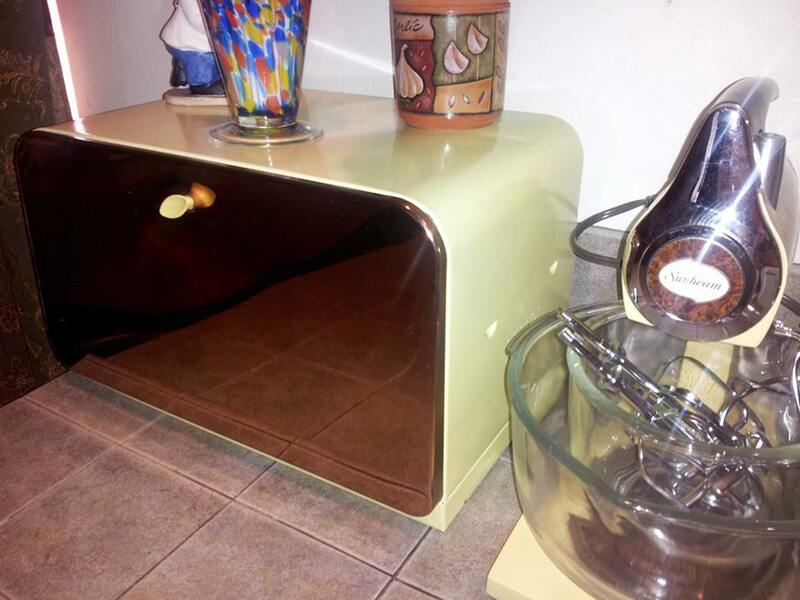 Meanwhile, Tara has recently purchased a vintage mixer and a bread box that just happens to match it, both in the same shade of what I refer to as 70s yellow. Not quite harvest gold, not quite mustard, but definitely recognizable as a symbol from that decade. Little by little, we’re turning our house into a shrine to the past, and I’m perfectly okay with that. Our collection of retro kitchen items is growing. That evening we went to the Bite of Oregon. Many years ago, in a former life, this was a tradition of mine, but I stopped going when Rusty was still in diapers because landing on the second weekend of August as it does, the weather is invariably hot, and it’s uncomfortable walking around in the blazing sun surrounded by thousands of sweaty people. Tara wanted to go last year, so we hit upon the perfect solution: go in the evening, when dusk is falling (and it’s dinnertime, anyway). It worked out great then, and just as well this year. We sampled cuisine as varied as a Banh Mi sandwich featuring Oregon carved tri-tip on a French baguette with Asian slaw; potato confit puree with pomegranate demi glaze, garnished with braised pork belly and baby arugula; Buffalo mac ‘n cheese with grilled seafood cakes; Pinot Noir braised beef on polenta with arugula; and blueberry tabbouleh salad garnished with pink shrimp and crème fraîche, all courtesy of a chef’s tent (new this year) featuring small plates prepared by some of Oregon’s top chefs for only $4 each. And they were really, really good. So much so that I was too full for the alligator on a stick we passed later on. Damn it. 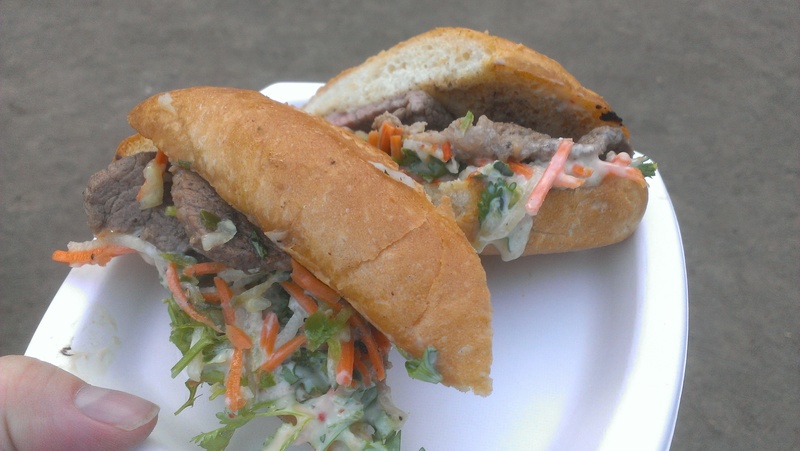 One of the delicious plates we shared from this year’s Bite of Oregon festival. Sunday was more about chores and work than anything else, though we did meet up with the kids for dinner. We hadn’t seen them since the camping trip, and wanted to catch up (and take advantage of the Olive Garden’s Never Ending Pasta Bowl, the perfect fairly-cheap solution to feeding hungry teenagers). We had a nice time. There’s a certain, I don’t know, friendliness and lack of pressure in meeting up like this now? Not that things were hostile when we all lived under the same roof, but it’s definitely a more fun vibe, if that makes sense. The evening ended with the return of The Greatest Show Ever, Breaking Bad. Words cannot even begin to describe my excitement over seeing Walter White back on TV. And now I’ve got a new catchphrase: “tread lightly.” Love it. LOVE IT. Hope your weekend was every bit(e) as fun! That’s what’s genius about the show: as evil, conniving, and cunning as Walt is, on some level you still feel a bit of sympathy for him. I have no idea why! Thanks for stopping by. As you know Mark, I love wine. But I can as crazy as you and Tara did on only ONE glass. I love to put my headphones on and dance around my apartment, whilst listening some of my favorite ’70s and ’80’s disco tunes in just a pair of underwear! 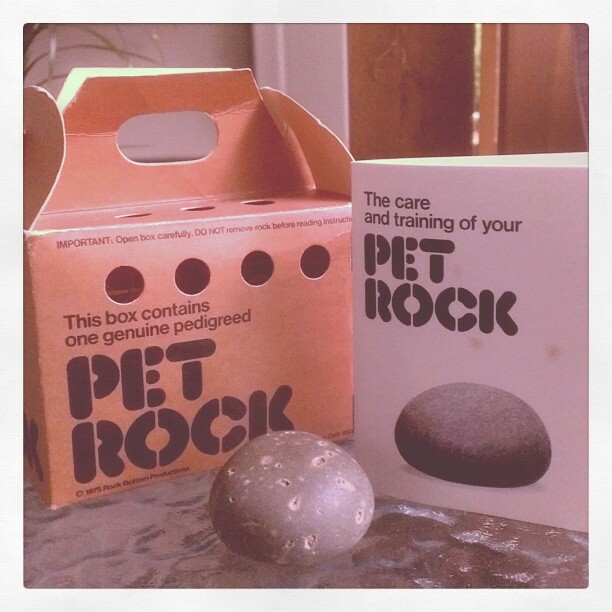 LOVE the photo of the Pet Rock. I remember when they first came out; seeing them in Bloomingdales in NYC. Never got one, but always wanted too! “Roll over” is going to be especially tough. I’ll just have to give him lots of treats and scratch him behind the ears for a job well done. Are we going to have to start calling you “Risky Business” now, Ron? I love how your weekends go. You two crack me up!! Thanks! “Tread lightly” is a phrase you might want to remember when you decide to go running through the sprinklers again…especially with those nasty slugs you have slithering around…. Sorry you had a hangover, but I think it made for a great story. Next time involve water balloons. No, I didn’t have a hangover. That was the whole point. But Tara did! When you say that you have “a love for all things 70s”, are you including disco? I hope not, disco diluted the great spillover from the ’60s culture that was going on. I’m so jealous about your breadbox, you have no idea. It’s “primo”! Actually, even though I’m a rock ‘n roller at heart, I do have a soft spot for disco. The Bee Gees, Donna Summer, Sister Sledge, Chic…bring it on. Bring it all on! Sounds like a wonderful time was had by all! What time of the night did this sprinkler running take place? It was probably around 11 PM that the sprinkler running took place. Not terribly late, and a lot of the neighbors still had lights on, so hopefully we only annoyed people without actually waking them up. This was just plain fun to read. A tip I remember from my own Pet Rock: When you advance to “roll over” it’s easiest if you start the training on a hill. Ahh…gravity! It’s such a wonderful invention. Thanks for the tip! I may live in Ecuador ( which sounds exciting), but my weekend was boring compared to yours. I did go to a great party on Sunday, but Sara has been in the US for two weeks preparing our container to ship. When she’s gone, there’s not nearly as much fun. I know the feeling, Kathy. Hope she’s back soon to liven things up! I’m not familiar with the blog, but I do like Feist. Thanks for the link!